Damping off is a term used for the sudden death on new plant seedlings. It can be caused by any of a handful of fungal diseases, including several root rots (Pythium, Phytophthora) and molds (Sclerotinia or white mold, Botrytis or gray mold). When young seedlings seem to be growing healthy one day and dying off the next, it is probably being caused by damping off. Damping off can affect the stems of seedlings both below the soil line and above. Some seedlings may start to grow and suddenly whither. Others will have stems that appear pinched or broken, causing them to collapse while they still have their cotyledons attached. You may see some gradual discoloring or it may happen very suddenly. Often it appears the seedling has been pinched off at the soil line. Seedlings with root rot can appear to be wilting, even when kept watered. 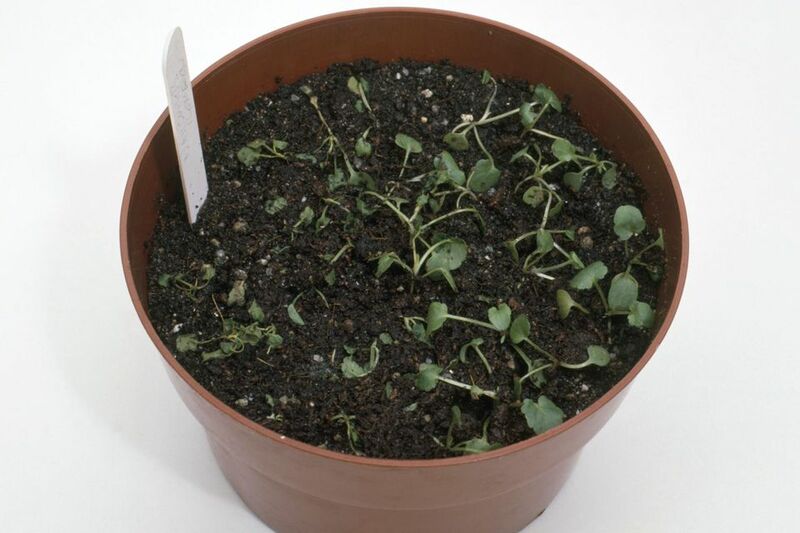 Even poor germination may be attributable to damping off. If your seedlings were growing along fine and suddenly wilt and die, it's a good bet they have succumbed to some form of damping off disease. There is no cure for damping off, once it occurs. The tiny seedlings die so quickly, you probably would not have time to help them if you could. That's why it is important to try and avoid the problem altogether, with the following prevention practices. Damping off spreads rapidly. If you should spot signs of damping off, remove those seedlings immediately and apply one of the homemade fungicides described below, to all remaining seedlings. Use a sterile potting mix, rather than soil from your garden. The funguses and molds that cause damping off can live in the soil and outdoor garden soil can harbor all kinds of fungus spores. Start with clean pots. Even the small amount of soil clinging to plant pots is enough to provide a safe harbor for fungal spores. If reusing pots, sterilize in 1 part bleach to 10 parts water. Plant your seeds at the proper depth so they don't have to work so hard to germinate. Don’t bury the plant’s crown. Don’t crowd your seedlings. Be sure to leave room between them for air circulation. Fungal diseases and mold favor damp conditions. Water seedlings from the bottom, by placing the container in a tray of water. This keeps the seedling itself dry and less susceptible. Add a thin coating of sand or gravel on top of the potting soil, to keep the surface relatively dry. The soil underneath will remain moist, even if the sand or gravel dries out. Don’t over water your seedlings or leave them sitting in water. Drain off any excess. If possible, create a breeze by placing a small fan nearby and turning it on periodically each day. This will prevent humidity from settling on your seedlings. Give your seedlings plenty of heat and light, so they germinate and grow quickly. Damping off only affects seedlings. If you can get them past the seedling stage, they're safe. Remove any affected plants or trays of plants immediately. Damping off will quickly spread to nearby plants. Sterilize Your Own Soil Sterilize small quantities of soil by heating it. Doing this in the oven gives off an unpleasant odor, but microwaves don’t seem to produce the same problem. Place dampened potting mix in a microwave safe container and cover loosely. Microwave on high for 8 - 10 minutes, until you see condensation under the lid. Close the lid and let the potting mix cool on its own. Caution, it can get surprisingly hot. Make your own Organic Fungicide You can use any of these 3 homemade concoctions as a preventative. They will not cure damping off once it has started, but they will give you an edge to prevent it from taking hold. Prepare a strong brew of chamomile or cinnamon tea and use it to water and/or mist your seedlings. Mix a splash (1 T.) of 3% solution of hydrogen peroxide/quart of water and mist the seedling with it. Apply a light dusting of cinnamon on the soil surface. A strong, commercial fungicide is a last resort for controlling damping-off and will probably be applied too late to be effective. Sadly, sometimes you have to be prepared to start over. If so, be prepared to take precautions ahead of time. Why Is There Grey Mold on My Flowers? What Should I Do About Gray Mold (Botrytis) on Tomatoes? Should You Fear Late Blight? What is Tomato or Potato Late Blight? How Do You Prevent and Control Powdery Mildew? What is a Method to Deal With Vine Borer Damage? How Do I Solve Cucumber Problems With Bacterial Wilt? Learn tips for creating your most beautiful (and bountiful) garden ever.